This page needs more stuff! Any E2 Headrush users out there want to help out? If you are interested, want to provide a review, user tips, or have any information on using the E2 Headrush for looping, please contact us. Picking up where the Headrush E1 left off, the E2 Headrush brings together 16-bit digital delay with times from 0.5ms to an 35 seconds, tape echo simulations with 4 separate heads, and a looping recorder in one pedal. In addition to offering digital and analog-type delay sounds, user-selectable delay options allow for control of signal output. There are several realtime interval and level adjustment selections as well as feedback level for repeats. 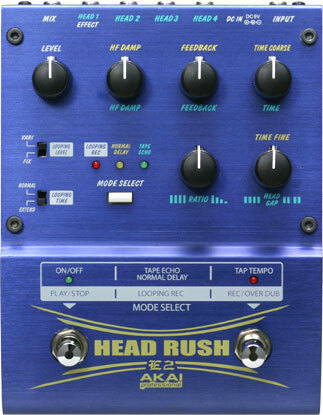 Headrush can also simulate a 4-head analog tape echo machine and it is possible to set the spacing between the virtual heads to create complex multiple delays and repeats. The outputs of each of the virtual heads appear on individual outputs for use with an external mixing console. The looping mode allows you to record and overdub layers of sound in real-time. Depending upon which mode is selected, the left switch controls the on/off and play/stop functions while the right switch sets the tap delay time or recording and overdub options. The LED display indicates which effect is in use and blinks in time showing the delay time selected.